The balance between demand and supply appears to be in favor of ship owners, active in the dry bulk market, as we head towards 2019. 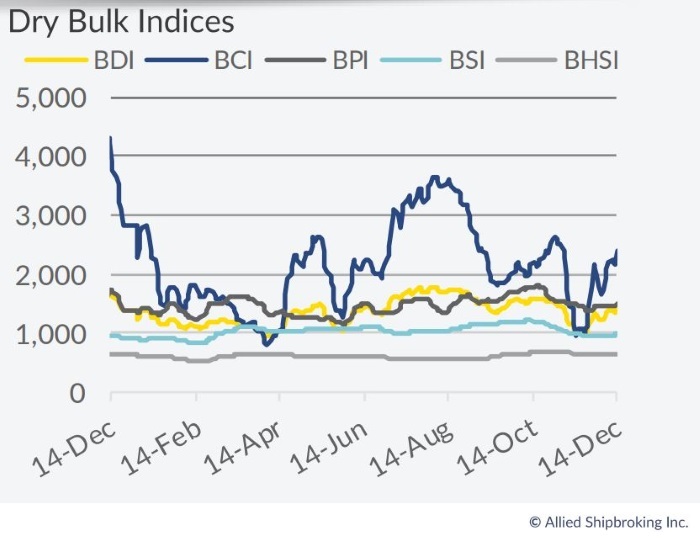 In its latest weekly report, shipbroker Allied Shipbroking said that “since the beginning of 2016, when the dry bulk market reached its absolute bottom, freight rates have been ever since on an upward trajectory. Taking the BDI as a benchmark, we saw the index from a yearly average of 676 points in 2016, increasing to 1,149 points in 2017, and now reaching for the year so far 1,351 points. Taking the size segments separately, Panamax and Supramax sectors were leading the herd this year, with their TCA yearly average figures boosted by -more or less- US$ 2,000/day (a relative increase of around 21%) and climbing well above the US$ 11,000/day mark. Furthermore, in the Handysize segment, we witnessed an increase of 13.5% on y-o-y basis, while in the Capesize segment the BCI-5TC improved by 8.6%. At this point, it is important to mention that the rather mediocre increase in the Capesize market is impart influenced and a mere reflection of the hefty downturn and amassed disarray noted at the beginning of November (while not long before this, most seemed confident that they would see returns even in excess of those of the final quarter of 2017)”. 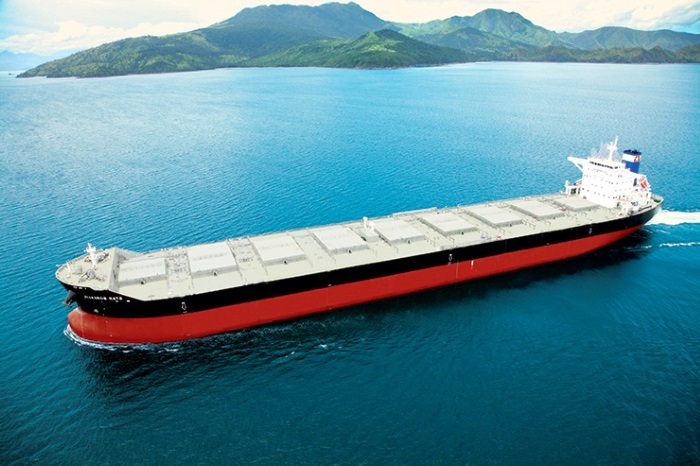 According to Allied’s Research Analyst, Mr. Thomas Chasapis, “notwithstanding this, another way to better understand the “actual” path that dry bulk sector has been following, we need to evaluate the risks involved relative to the corresponding earnings. An important risk metric is by measuring the prevailing volatility in the market. Using the standard deviation as statistical tool to capture cur-rent trends, we can conclude that the overall dry bulk market has been more stable this year. In absolute terms, all main size segments saw their actual volatility figures decrease, with Handysize witnessing the biggest decrease (52.7%), followed by Panamax and Supramax with 41.5% and 37.9% respectively, and finally Capesize with 15.2%. While considering that actual returns were considerably higher, the real impact of these deviations is even less than the percentages mentioned above”. Allied added that “given the recovery and the overall positive track noted in the market, let’s try to figure out what’s in store for the near term. As at the start of this month, the total dry bulk fleet (above 20,000dwt) stood at 10,198 vessels, with an orderbook of 907 vessels (an orderbook to fleet ratio of 8.9%). Even with a completely absent recycling market and all projected deliveries entering active service without delay and as scheduled, we are facing a maximum fleet growth of 5.3% for 2019. Moreover, given that most forecasts predict an increase in the region of 1.5-2.0% for seaborne trade of the main dry bulk commodities (iron ore, coal, grains), the fundamentals in the market indicate an overall balanced outlook for the supply-demand dynamic, in the short to medium-term at least, with potential for an even better outlook to emerge”. Chasapis said that “all-in-all, even with the core market fundamentals being in favor of further improvement for the next couple of years, the great uncertainties that characterize shipping industry as a whole leave little room for any excesses in sentiment. Optimism, with a pinch of conservatism, are the necessary characteristics to be able to better react and adapt to periodical trends and shifts. Coal’s overall gloomy outlook, China’s decision to retract its tariffs and commit to buy a large volume of US soybeans (even if it only represents roughly 4% of a typical year’s purchases) easing back some of the “tension” if only for the moment, along with a plethora of new regulations coming into force in the not so distant future, are just a handful of market aspects that could have a major impact, rapidly altering the state of the market. With a relatively positive year now coming to an end, let’s embrace a new one and hope for even better days to come”, he concluded.